I have been hearing about the USS Flag a lot with what I've been listening to recently, and while I never had that (and didn't know anyone who did), I did have an absolutely HUGE playset for GI Joe. 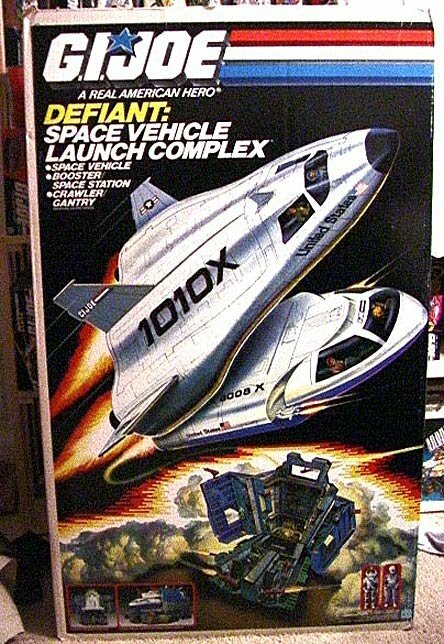 Sold in 1987, and I believe I got it for Christmas that year, was the GI Joe Defiant Space Vehicle Launch Complex. Being a fan of GI Joe and Star Trek, this obviously made sense for my parents (or was it my grandfather?) to get me. It was enormous, taking up a good chunk of floor space in my room, but I played the heck out of that. At a retail price of $99.99, that was definitely my big gift that year, and 12 year old me was thrilled! Add this to the fact that I had the Batcopter (which o one else seems to have had) and I was a very spoiled child.